In order to provide quality healthcare to all, information technology has become essential. Off late, telemedicine has generated strong excitement and anticipation within both developed and emerging countries. Infact, telemedicine is a technology initiative that has the potential to revolutionize healthcare especially in rural India. In a recent development, Dr Devi Prasad Shetty of Narayana Healthcare launched a telemedicine initiative with the Border Security Force (BSF) STS Camp in Yelahanka with Narayana Healthcare, Bangalore. With this facility, BSF patients who are far flung can now consult with experts for treatment and consultation. Allaying recent fears about rising cases of dengue and chikungunya across the country, some state governments are looking at ways to provide affordable healthcare to the patients not just in urban cities and towns but also in the rural and far flung areas. Indian Space Research Organization (ISRO) has launched a dedicated satellite for healthcare and also the government under the National Rural Health Mission (NRHM) has earmarked a sum of Rs 10 million per annum for state government to increase telemedicine in their respective states. Already states like Madhya Pradesh, Harayana, Punjab are leading the way and other like Karnataka and Tamilnadu are getting into it. In a country like India, where healthcare access and facilities to all is still abysmally low. Setting a new paradigm in telemedicine technology, Tele-ICU is a kind of virtual ICU (intensive care unit) that remotely monitors a patient’s status via state-of-the-art audio-visual communication and computer systems with the help of a good networking with the bedside ICU team. Tele-CU uses state-of-the-art equipment to connect patients to intensivists 24 hours a day, seven days a week, from anywhere in the country. Doctors and nurses, at a centralized location, use remote-control cameras, video conferencing and continuous monitoring technology to access real-time patient information. This service continues to provide care to ICUs in major cities to smaller Tier II and Tier III towns. In theory, a fully deployed telemedicine ecosystem would increase the quality of healthcare services by increasing access to constrained resources like doctors while reducing costs through greater utilization of assets such as doctors and hospitals. With state governments exploring telemedicine beyond the parameters of cost, quality, and access to healthcare itself, it’s time other states follow this model. Reports indicate that the India’s Telemedicine market is estimated at $10-12 million and is expected to grow at a CAGR of around 20% over the next five years. 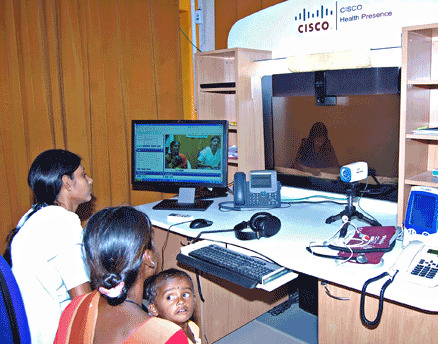 It is estimated that 150,000 people in India are already benefitting from telemedicine every year. Growth in the telemedicine market is expected to be driven by India’s lacking healthcare infrastructure and shortage of hospitals and doctors, especially in the rural areas. Other key growth drivers include the widespread use of wireless and web-based services, and improving technology which includes the adoption of 3G and upcoming availability of 4G spectrum and optic networks. Every technology has its share of challenges. These include infrastructure challenges such as poor bandwidth in some areas are indeed a hindrance. However, implementation and viability seem to be some of the biggest issues at the moment. Another challenge has been the lack of technology skill sets in rural India. In order to implement telemedicine, training is needed at the village end for technicians, IT staff, and local doctors. While at the consulting doctor’s end, a lot of pushy administration and coordination is required. So far, telemedicine in India has been largely a free offering by large hospital groups. Large hospitals are able to offer these services at no extra charge because of their in-house expertise. However, time for consultations is an issue, and there is a lack of incentive due to no fees being recovered. Some of the key players, including organizations with the facilities able to provide telemedicine services include the AIIMS, PGIMER, Fortis Healthcare Ltd, Apollo Hospitals, Narayana Healthcare Ltd, Fortis Healthcare Ltd, Manipal Hospital and Aravind Eye care, among others. Medical Equipment Providers include GE Healthcare Ltd, Wipro Healthcare Ltd, Philips Healthcare Ltd and Siemens India Ltd. Telemedicine software providers include C-DAC, Televital, Apollo Networks.